Q I enjoy gardening and was wondering about creating a garden for my rats so they can come out and play. Would this be harmful to them in any way? Q My biology II class is doing an experiment. We are seeing if a vertebrate can live on dried fish. We are having some problems keeping the mice alive. I was wondering if you could bless me with any information to spread light on the subject for me and my class. We just want to keep our mice alive. A This is an interesting question. Not being an expert on mouse nutrition, I can’t tell you specifically what the problem is, but I can offer some possibilities. It’s possible that the answer to your question may be “no,” at least this species of vertebrate can not live on just fish. While mice can and do utilize whatever protein they can find in their diet, they are most certainly not just carnivores. It’s possible that the fish lacks some very essential diet elements. I know the laboratory diet I use for my animals lists fish meal as its primary protein source, so I don’t think fish in itself is your problem. It may be that it lacks certain vitamins, minerals, or other diet components. Are you feeding whole (ungutted) fish? I have sled dogs (Malamutes), and there is an enormous amount of evidence that back in the 1890s–early 1900s, sled dog teams in Alaska were primarily kept on dried salmon . . . and nothing else. These dogs were fed nothing but a dried or frozen fish every 2 or 3 days and did an enormous amount of work on a strictly fish diet. It did occur to me though that those fish were whole. It’s possible that the internal organs played a major role in completing the diet. Another thought, are you sure there is not an environmental factor involved? Do you have a group of control mice that are getting a normal (preferably lab block) diet? If not, it might be a good idea to set one up. This way you can see if there’s something other than diet involved, and you can also see how the fish diet affects the mice in comparison to a normal diet. Reply from Carmen Jane Booth, D.V.M. A As a veterinarian with a great deal of research training and familiarity with the Animal Welfare Act and the NIH Guide for the Care and Use of Laboratory Animals in Research, I am concerned by this experiment and what it really is teaching these students. It shows a complete lack of regard for animals, their humane treatment, and that mice are merely “test tubes with tails.” Please understand that I am not against animal use in research for the advancement of science, medical knowledge, and treatment for humans and animals. This experiment does not serve any useful purpose and is in my humble opinion, inhumane. There are numerous studies and published guidelines on the nutritional and dietary requirements of rodents. 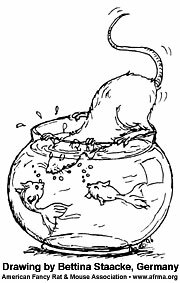 A diet consisting of dried fish is inadequate to meet their nutrient requirements, and I am not surprised that the mice are not surviving. If the fish is dried and has a high salt content, this could also be toxic. Mice have a very high metabolic rate and need a high energy diet with all the appropriate micronutrients. A study such as this would never be approved by an Institutional Animal Care and Use Committee (IACUC). All research in the United States is highly reviewed at both academic institutions and in industry must have IACUC approval for all animal experiments to assure the humane treatment of animals in research. I do not fault the students involved in this experiment, but the teacher should have known better or asked a veterinarian or research scientist for help in making sure the experiment was designed appropriately and was humane to the animals.